A washed rind blue? Never heard of it, nor has Pual Broughton from C’est Cheese, but he reckons it’d be worth a go. This is not a traditional style of cheese, but with a twinkle in his eye Paul thinks he could make it by taking a blue brie or a harder style, and washing it with a local Martinbourgh Pinot Noir. Paul has just added an eatery and a cheese factory to his C’est chess sohp, and fingers crossed he’ll get his liquor licence and MPI approval to started making and selling blue cheese. You’ve got to hand it to Paul, he’s not afraid to challenge preconceptions. Who’d’ve thought an artisan cheese shop would survive, let alone thrive, in sleepy Featherston, an hour of so from Wellington over the Rimutaka Hill? Yet thrive it has as it enters its sixth year. I love visiting Paul and C’est Cheese. The tasting cheese today was Blue River aged cheddar. Paul told Catherine, my fellow cheese fiend, and I about how this is some of the last that they made. He’s bought up the last 600Kg after they closed their cheese making facilities. So get in quick. It’s a big mouthful of sweet nuttiness. Paul’s enthusiasm and vision pervades everything they do at C’est Cheese. He built everything in the expanded shop, right down to the putting up new beams! The kitchen and menu, through small are perfectly formed. Catherine, a judge in the recent NZ Cheese Awards, had the Huevos Rancheros with Drunken Nanny Lush goat cheese and I had a Wairarapa Omelette with Gouda, Kingsmeade pecorino and a side of Beef and Blue sausage. And oh my, these were the best cheese sausages this curd nerd has tasted. Paul’s says his secret is that while most butchers use a kit with dried blue cheese he takes real blue cheese and gets a butcher up the way to crumble it into the mixture. So along side my (obligatory) Mahoe Old Edam (crack cheese of the highest order), a ripe Grinning Gecho Brie, and a piece of Invercargill Blue River Cheddar, I added six sausages and a frozen takeaway of their spicy Mac and Cheese. Those of you who know me know I love this shop. Catherine noted you can really nerd out with Paul. He is knowledgeable, generous and passionate, and most of all he has a vision. A vision of his Wairarapa cheese empire and dreams of making blue cheese. Good luck with MPI Paul, cos I want to try your washed rind blue. I reckon it’ll be something! 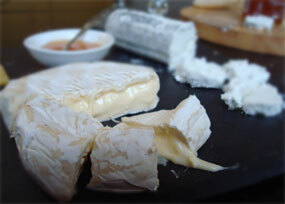 The very first washed rind made in NZ was Gibbston Gold by Gibbston Valley Cheese. I recall the first batch being perfect, and then a succession of batches that kept on growing blue mould. Probably a consequence of factories not being that sophisticated in terms of airflow in those days. I have seen blue cheese with b.linens splotches, but perhaps the blue mould overpower it? Would be an interesting cheese. Thanks Steven, it’s great to hear how cheese is continuing to evolve in NZ. It would be combining two different styles of ripening so I think my money would be on the blue Brie. But I am no cheese maker, just an eater! A funky experiment! Our Blue Monkey which is cloth-ripened gets all sorts of different colour splotches and moulds on the outside but once it has been de-clothed, the blue is the supreme winner of the mould race. But it is traditional to make a hole in the top of a stilton and feed port into it, so we think Paul will have some fun experimenting with the pinot rind washing. Looking forward to a taste. And by the way that was a terrible thing to have to read about C’est Cheese new menu before I’ve had breakfast. Now I’m really hangry! Mmm Blue Monkey now I am even more hungry! I think it’ll be exciting to try Paul’s blues. I like that he wants to focus on a variety or two. The factory looked great. But I forgot to take a photo – too busy eating and shopping.